❤Why are these dog clippers worth buying? these dog grooming clippers are the best choice. Simple operation, easy to use, you can always beautifying your pets anytime and anywhere with these pet clippers. ❤What are the advantages of these dog clippers? ✔Necessary accessories: Four worry-free guide combs (4-6mm/7-9mm/10-12mm/16-18mm)，help you easily control the size and even though you never used dog grooming kit. ✔Stainless steel & ceramic mobile blade: Long - term use without rust, don't pull hairs when you shave. ✔R-shaped edge design: Prevents accidental injury to your pet. ✔Rechargeable cordless design: Easy to use, lithium-ion battery of dog clippers offers long-lasting trimming performance. ✔Quiet running clipper： Working noise lower than 60 DB, these dog grooming kit will not scare you pet. ❤What's in these pet grooming clippers packaging? The cordless dog grooming clippers deserve your try! Any problems during grooming in the future, please Email to us firstly or Ask questions on product page. We will offer full refund or replace your pet's shaver with a new one if you do not want to keep it. ✤Multifunctional pet clippers: The dog grooming kit includes 4 worry-free guide combs (4-6mm/7-9mm/10-12mm/16-18mm) to make it perfect for complete animal clipping trimming and grooming. And these dog clippers with the adjustable blade length design, you can adjust according to your needs. These dog clippers can meet everything what you need about pet grooming, as good as approvers describe it. The dog hair trimmer suitable for small dogs cats and other furry pets. ✤Precision-cut titanium blades: The blade of dog clippers is made of stainless steel and ceramic mobile blade. These pet grooming clippers will not rust. Due to the Precision-cut blades, there's no uncomfortable pulling at your pet's hair, titanium blade and ceramic blade maintain excellent sharpness while prevent from hurting your pets easily. The dog grooming kit provides a perfect clipping trimming and grooming experience for your pet. Don't miss these dog clippers. 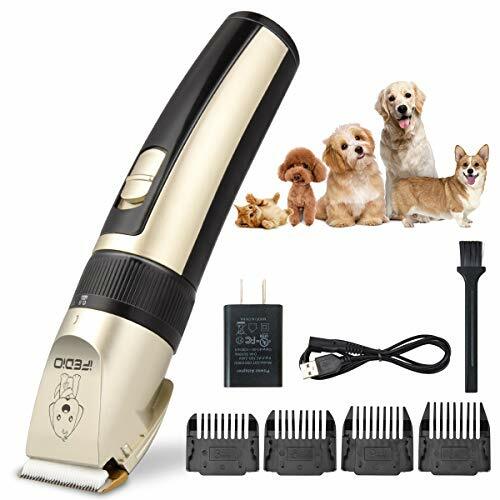 ✤Exquisite and durable pet grooming clippers: Ultra quiet design, these pet clippers use high quality motor, low vibration. So these dog clippers won't disturb your pets. The dog grooming kit includes excellent quiet-running pet clipper that cut without pulling at the hair coat. Your pets can enjoy a comfortable shave in peace. These dog clippers are very useful both in home and profession salon! Using these dog clippers can help you to save a lot of pet grooming costs. ✤Rechargeable cordless pet trimmers: These dog clippers can last for 240 minutes and can be charged in 3.5 hours. Lithium-ion battery of dog grooming kit offers long-lasting trimming performance. These dog grooming clippers have a charging indicator. It is convenient for you to know the charging situation of dog clippers. Thanks to the cordless design, you can use these pet grooming clippers anytime and anywhere. ✤Excellent customer service: The dog grooming kit keeps your pets looking good all the time. These dog clippers have excellent workmanship. We also guarantee excellent after-sales service, 1-Year manufacturer's warranty and 30 days no-questions-asked return policy. If you have any questions about these pet clippers, please contact us! We guarantee a satisfactory solution for you. If you have any questions about this product by TXPY, contact us by completing and submitting the form below. If you are looking for a specif part number, please include it with your message.